I took a weeks holiday recently to spend some time in my favourite location for shooting wildlife in Selsdon Wood. This is a nature reserve on the southern edge of London. Its a large reserve of 81 hectare or 200 acres of beautiful woodland and large areas of meadow that is not mowed in the summer so the grass gets really tall. This is great habitat for all kinds of insects, and a large variety of butterflies and wild flowers of all kinds including wild orchids. The woodland areas are full of wildlife, including some rare white squirrels I have not managed to spot them as yet but I hear they have been seen recently. There are a few deer in the area as well.I have captured one of these. The site is managed by the friends of Selsdon Wood. This is a group of volunteer's who do a great job working with Croydon Council doing essential maintenance work to keep the whole site looking great. On this particular day of my holiday the weather was not great, we had had a lot of rain and the insects had all run for cover I think. So I was really struggling to find something to shoot. I was just about to give up and make my way back to the car when I saw in the distance some nettles with what looked like a black growth all over the stems and leaves. As I got closer l realised it was moving like Medusa's hair. It was hundreds of black caterpillars that I found out later were the caterpillar of the Peacock Butterfly. I have seen four or five in one place at a time, but not hundreds. This may be a common event as apparently the female Peacock Butterfly lays it's eggs in batches of 500, but I had not seen so many in one spot before. At last I now had something to shoot. I set up the tripod and started to shoot lots of different angles but the stills just did not portray this amazing subject. So I made a set of video clips and edited them into this short video. For those of you interested in the gear. I was shooting with a Nikon D 7000 and a Tamron 90mm f2.8 macro lens. Warning this video may give you nightmares. I did manage to bag some nice shots that week some of them you can see in this blog post. The Roe Deer was shot in an adjacent field to the woods. They are very nervous and run off at the slightest noise. 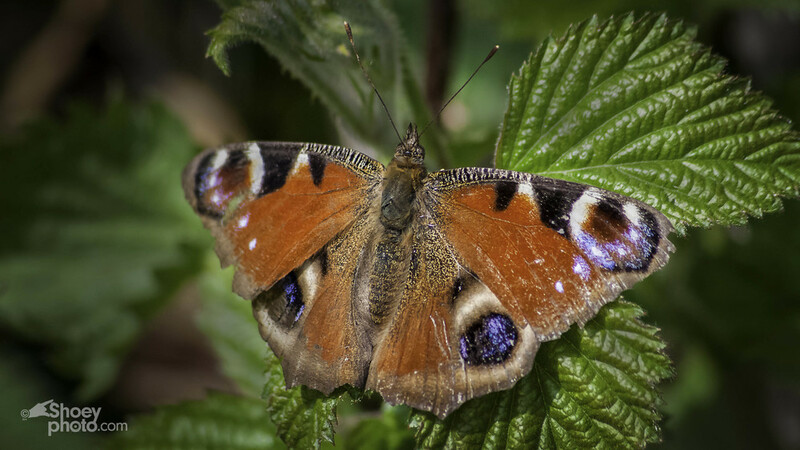 The Small Heath and Peacock Butterflies were shot in one of the meadows that are a magnet to all kinds of butterflies. Selsdon Wood nature reserve is a great location for macro and wildlife photography. If you have a dog they will love Selsdon Wood, so if you are in the area give it a visit. Here's a link to the friends of Selsdon Wood website. It gives lots of useful information on all the wildlife to be found there and it's location. Thank you to all the volunteers for making the wood such a pleasure to visit. If you enjoyed this post please comment and share thank you.